These workshops explore different aspects of being alive, well alive, as individuals and groups. They are for groups between 4 to 12 people, for a duration of about 2 hours or more. Named after a poem by Alexander Solzhenitsyn. Emy shares basic knowledge of the Autonomic Nervous System and guides the participants through breathing exercises that can help operate a switch from the Flee or Fight response to the Rest and Digest response. Hence, hack anxiety. 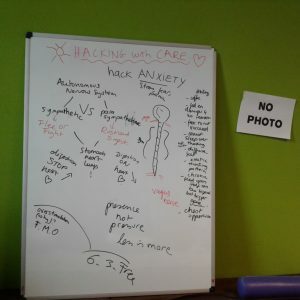 The workshop is also an opportunity to reflect together about what causes stress, anxiety, panic attacks, and to share and explore coping mechanisms. Number of participants limited to 10 or less. How does it feel to be present ? What interferes with our being here now ? How to practice being present to ourself, our work (massage or other), other people or a place ? 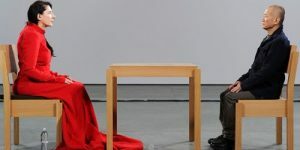 The name of this workshop is borrowed from Marina Abramovic’s performance during her retrospective exhibition at the MOMA in 2010, where she sat for hours on end in a face to face with one visitor after the other, always refreshing her gaze and welcome. With Emy guiding, participants re-enact a selection of famous artists performance, to explore different qualities of being present.